Zumbathon, originally uploaded by captainjay. 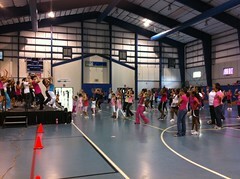 We had a great turnout for the Zumbathon that was held yesterday to benefit the Susan G Komen for the Cure. Two hours of zumba for a great cause. I didn't stop the whole two hours and had a blast! Several different instructors from on island took turns leading routines and had their class come up to lead a few. So yes, the UVI class came up and lead a couple songs and did a great job. There are some good instructors on island but I have to say that our instructor, Joni Jones is the best one. She has the best routines and easy to follow and she's just as cute as she can be. So if you're looking to start taking a zumba class on STT definitely take one of Joni's classes at UVI or Antillies.